KATHMANDU, Nov 8: The National Reconstruction Authority (NRA) is flooded with over 173,000 complaints relating to the grant amounts from earthquake victims in the 14 most-affected earthquake hit districts and the number of complaints is only increasing with each passing day. However, the authority has been too slow to sort out the complaints, preventing many eligible victims from receiving the housing grant amount. Of the total 173,978 complaints registered so far, the NRA has initiated the process of addressing only 15,880 complaints. Officials of the National Reconstruction Authority (NRA) have said that it will take more than three months to sort out all the complaints. “As our top priority was to distribute the first installment of the grant in those districts, we could not concentrate on sorting out the complaints and the task of addressing the complaints from the victims was overshadowed,” joint-secretary of NRA Kali Prasad Parajuli, who oversees complaints at NRA, told Republica. He said that the process of addressing the complaints was also hampered by the festival season. According to him, majority of the total complaints registered so far are from the quake victims whose names have been either left out from the list of the victims eligible for the grant amount or from those whose houses have been left out in the victim identification survey. 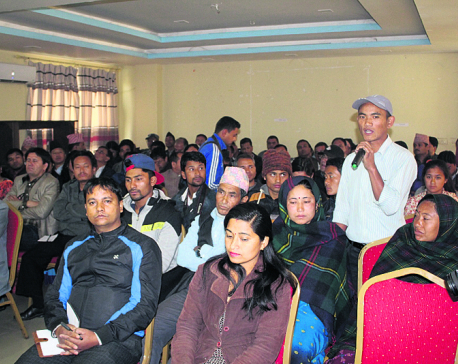 Likewise, as many as 35,095 complaints have been received from the quake victims living on the land owned by the Guthi Corporation demanding that they should also be provided the house reconstruction grant. The victims living on the corporation's land whose houses have been completely damaged by the last year quake have not been included in the grant distribution process as the NRA regulations state that only those victims who have land ownership certificate can receive the grant amount. Similarly, 7,897 complaints have been filed by the victims living on public land, demanding that they also be provided the grant amount for house reconstruction while 1,392 complaints have been registered demanding relocation of risky settlements. “So, we have a large amount of complaints related to reconstruction and rehabilitation. We are working to address the concerns of the victims as soon as possible,” Parajuli said, adding, it will take more than three months to sort out the complaints. He said that the NRA has recorded online as many as 74,665 of the total 173,978 complaints received to see whether victims who have been left out in the grant distribution list or the identification survey are eligible for the grant amount of Rs 300,000, the retrofitting grant of Rs 100,000 or not eligible at all. The government had earlier decided to provide Rs 100,000 as retrofitting grant for the quake victims whose houses were partially damaged by the earthquake. “So, we will soon start verifying the complaints. But still, we may not be able to deal with all the complaints since the NRA is yet to finalize criteria to identify partially damaged houses,” he added.